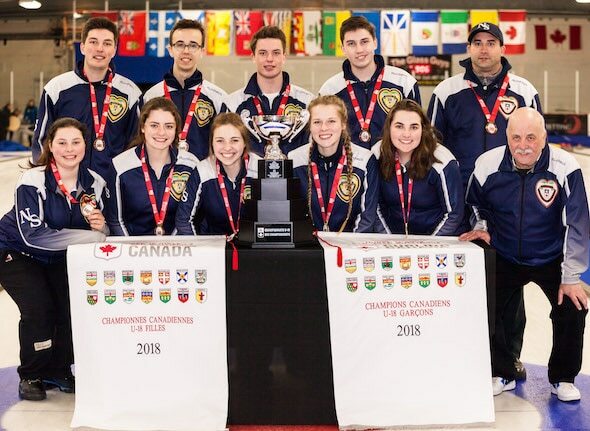 Nova Scotia teams claimed both gold medals at the 2018 Canadian Under 18 Boys and Girls Curling Championships — the second straight year one Member Association has swept both the girls and boys titles after Northern Ontario did it last year in Moncton. Those gold medals will nicely complement the gold medals captured by Kaitlyn Jones’s Halifax women’s team at the 2018 New Holland Canadian Junior Championships in Shawinigan, Que., and the 2018 World Junior Championships in Aberdeen Scotland. Graeme Weagle’s Nova Scotia boys team from Chester won the boys final 10-6 over Alberta’s Ryan Jacques (Edmonton), while Isabelle Ladouceur’s Lower Sackville team prevailed 4-3 over Saskatchewan’s Skylar Ackerman (Moose Jaw) in the girls final. Nova Scotia (Weagle was backed up by vice-skip/last-rock thrower Owen Purcell, second Jeffrey Meagher, lead Scott Weagle and coach Anthony Purcell) was 3-2 in the round robin before rattling off four straight playoff victories. That was evident in the early ends; Nova Scotia opened the game with a deuce, and held Alberta to a single in the second. 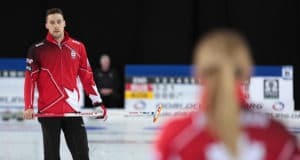 In the third, Nova Scotia simply made eight perfect shots and took advantage of key misses from the Albertans to put five on the scoreboard — capped by Purcell making a delicate outturn tap to remove a partially frozen Alberta stone and hold the shooter. 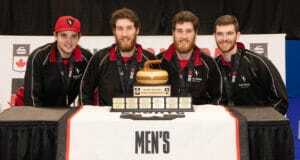 Nova Scotia added a steal of three in the fourth and it was just a matter of time before the gold medals were draped around the Bluenosers’ necks. 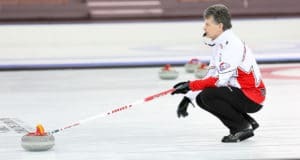 Interestingly, the Weagle team plays out of the same Chester Curling Club that produced Mary Fay’s 2016 Canadian and World Junior Women’s championship team. Jacques was backed up by vice-skip Dustin Mikush, second Gabriel Dyck, lead Michael Henricks and coach Bernie Panich. In the women’s game, back-to-back deuces from Nova Scotia turned the game around and propelled Ladouceur, vice-skip Emilie Proulx, second Kate Callaghan, lead Makayla Harnish, alternate Elsa Nauss and coach Brian Rafuse to victory. Saskatchewan blanked the first three ends before cracking a deuce in the fourth. But Nova Scotia came out strong after the fourth-end break, tying the game with a deuce in the fifth end, and then stealing two in the sixth. “We started to be aggressive, and it obviously worked out,” said Ladouceur. “We definitely made some nice shots; Saskatchewan made some amazing shots, too, but it just worked out in our favour, with a little bit of luck. What’s the secret to Nova Scotia’s recent run of success in youth curling? It’s pretty simple, suggested Ladouceur. Defending Canadian U-18 boys champ Jacob Horgan of Northern Ontario returned to the podium as his Sudbury team (vice-skip Max Cull, second Nicholas Bissonnette, lead Shane Robinson and coach Gerry Horgan) won the boys bronze medal, 4-1 over Newfoundland/Labrador’s Ryan McNeil Lamswood of St. John’s (vice-skip Coleton Vriesendorp, second James Trickett, lead Alex Phillips and coach Laura Phillips). In the girls bronze-medal game, Alberta’s Ryleigh Bakker (Calgary) scored three in the eighth end for a 5-3 win over Ontario’s Madelyn Warriner (Listowel). Bakker was backed up by vice-skip Hannah Phillips, second Rhiley Quinn, lead Hannah Airey, alternate Elysa Crough and coach Allison Earl. The Ontario team was rounded out by vice-skip Sarah Bailey, second Brianne Donegan, lead Shannon Warriner and coach Bruce Cox. Meanwhile, the doubles competition wrapped up on Saturday for players who didn’t take part in the playoffs. In the gold medal-game, featuring a pair of mixed teams, the duo of Jaycee Terrick (Manitoba) and Braden Fleischhacker (Saskatchewan), with coach David Murphy (P.E.I.) was a 4-2 winner over Lauren Ferguson (P.E.I.) and Troy Chong (B.C.) with coach Dave Trickett (Newfoundland/Labrador). Lead – Colin MacKenzie, P.E.I. Coach – Bryan Miki, B.C. Boys Championship Pool Coach – Bryan Miki, B.C. Boys Pool B – Troy Chong, B.C. Girls Pool A – Lexie Murray, P.E.I.